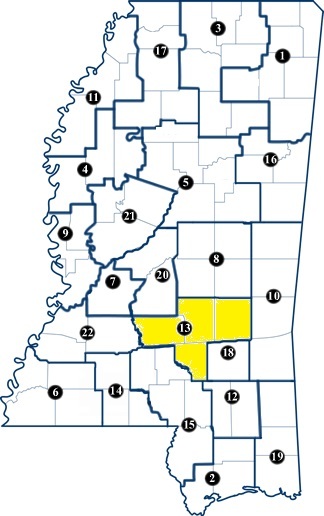 The 13th Circuit Court District consists of Smith, Simpson, Covington and Jasper Counties. This is a large district of four counties with five courthouses. The County Seats are Raleigh, for Smith County; Mendenhall for Simpson County; Collins for Covington County and Pauliding (1st Judicial District) and Bay Springs (2nd Judicial District) for Jasper County. With two judges hearing cases, to ensure that all cases, motions and other matters are properly set, please contact the appropriate Judge’s Court Administrator to get a court date and have your case set on the appropriate docket. All criminal trials are set at docket call. Civil trials may be set by agreed order or if need be by motion hearing. Scheduling orders are not required in all matters but the attorneys are encouraged to consider such orders when appropriate. When a case is set, we will do our best to put it on the appropriate docket, however to ensure that it is placed on the appropriate date, place and time please check the calendar which the staff will try to keep as up to date as possible. All motions which are accompanied by memorandum briefs should be sent to the respective judge and/or the staff attorney prior to the motion hearing. When possible, motions and briefs should be supplied to the judge and staff attorney no later than ten (10) days before the hearing. All cause numbers after 2016 will designate the appropriate Judge by the having a 1 or 2 at the end of the cause number. 2016-123-1 would be Judge Bowen and 2016-123-2 would be Judge Sorey. Judge Bowen’s Civil Motions will generally be on Monday’s beginning at 10:00 a.m. Judge Bowen’s Criminal matters, guilty pleas, revocations, arraignments, etc. will generally be on Tuesday’s beginning at 10:00 a.m. Judge Bowen’s trial settings will generally be Wednesday-Friday when in term. Judge Sorey’s Civil Motion Days will generally be on Fridays beginning at 9:00 a.m., unless there is Criminal Docket Call set at 9:00 a.m. in which case Civil Motions will begin at 10:00 a.m. Criminal matters, guilty pleas, revocations, arraignments, etc. will generally be on Thursday’s beginning at 9:00 a.m. Judge Sorey’s trial settings will generally be Monday-Thursday when in term. If a trial carries over from Wednesday into Thursday wherein criminal matters are previously set, said criminal matters will be taken up during recesses or while the jury is deliberating. ALWAYS CALL THE COURT ADMINISTRATOR TO SET AND/OR REMOVE MOTIONS AND/OR CRIMINAL MATTERS FROM THE DOCKET AND TO CONFIRM AVAILABLE TRIAL DATES.